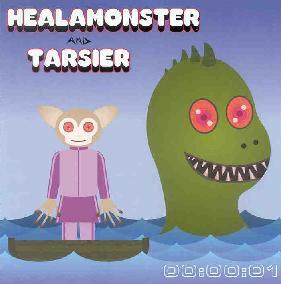 Healamonster and Tarsier - "00:00:01"
Healamonster and Tarsier are the Brooklyn, New York based duo of Burgess Tomlinson and Rona Rapadas, who play a hip-hop influenced brand of alt-rock/psychedelia. The CD opens with "Näg Chompy Raiine", which features slow melodic piano melody, trippy keyboards, and well done vocals from Tarsier, along with a strange hip-hoppy noise groove. "Hamster Wheel" and "Cotton Candy" are accessible songs, but with freaky sound embellishments. The electro drums on the former are a bit cheesy, but I like the robotic feel and the song is solid and presented in a heartfelt manner. "Can U Spare A Tuba?" has an oddball psychedelic Residents gone hip-hop vibe. "Creekside Instra MENTAL!!!" is a mucho spaced out song with an atmospheric flavor and, of course, cosmic trip-hop influences. "Müenster Cheeze" includes off-kilter dance beats and tripped out alien sounds. Like the B-52s at a DJ party in space. And "Heala Killa (HMT Remix)" consists of oriental inspired guitar, bubbling UFO synths, and the trademark robo-electronic dance beats. The duo really explore the Reggae influenced cosmos on this nearly 10 minute track. Dance, dark symphonics, and trip vibes are the order of the day on this ethereal head track. An interesting set of toe tapping trip grooves. For more information you can visit the 17 Ft. Jellyfish web site at: http://www.17ftjellyfish.com. Contact via snail mail c/o 17 Ft. Jellyfish Records; 282 Prospect Park W.; Brooklyn, NY 11215.